I was going to do a movie review this week, but due to the recent Supreme Court ruling on marriage equality in the states a couple of Fridays ago, I felt this was an appropriate article. It is much too difficult in this day and age to find a good story, whatever the medium, that promotes a positive depiction of gender equality and differing gender identities. It’s almost like trying to finding a good environmental story – it has to present the topic, but at the same time not be so preachy and condescending that it distracts from presenting an actually good story that makes you want to support the issue and not feel like you have to. It also has to portray it without presenting certain stereotypes or cliches that defeat the purpose of the message. In regards to feminism, gender identity, and sexual orientation, I feel Steven Universe fits the bill, and in quite a remarkable way. 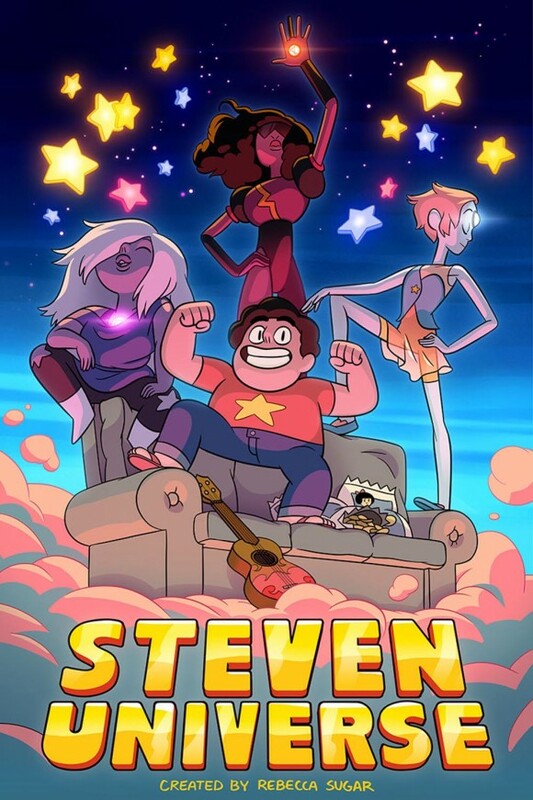 Premiering in late 2013, this show is about the titular Steven Universe (yes, that`s his actual name), a young boy who has inherited powers from his mother and fights alongside a group of super-heroins, called the Crystal Gems, to save the world. Throughout the series, Steven must figure out his powers and his place in his town of Beach City, and more broadly, his place in the world. The show is as much about growing up as it is about combating monsters and the supernatural. Luckily, Steven has the the three members of the Crystal Gems, Garnet, Amethyst, and Pearl, to help him along the way. The varied and well written female characters, along with an interesting and heartfelt take on relationships between people, make this show one of the most beautiful stories that I’ve seen and certainly the most important cartoon so far for gender and sexual equality. 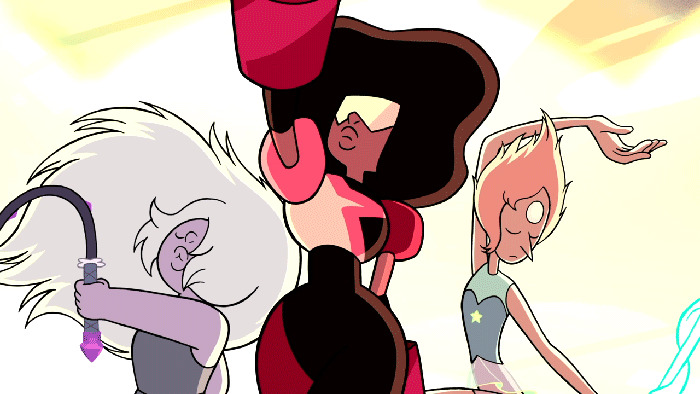 Steven Universe is the first Cartoon Network show to be created by a woman. 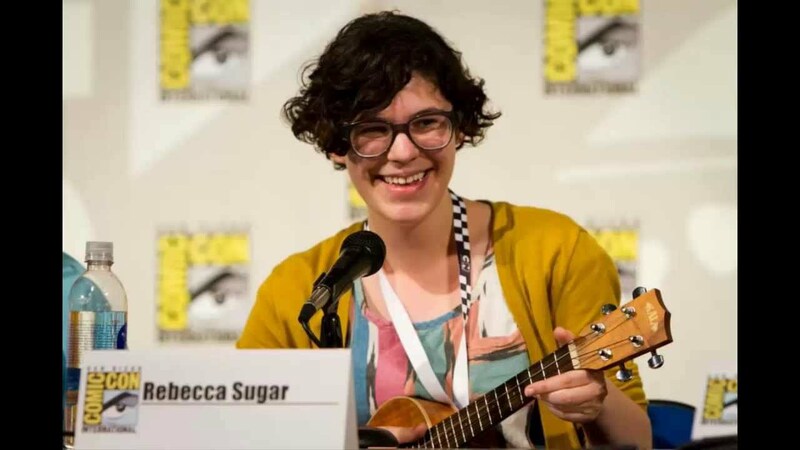 This woman is named Rebecca Sugar who is a former writer and storyboard artist of Adventure Time, and she… Wait… Let’s backtrack there… This show is the very first Cartoon Network show to be created by a woman?! It took over 20 years since its creation and nearly 50 original shows for Cartoon Network Studios to have a show created by a woman?! Let us take a moment to let that sink in and realize how flabbergastingly ridiculous and sad that is before we move on… Okay? Are we good? Let’s get back to the review. Anyway, Rebecca Sugar, is a remarkable person to have been one of the people to bring us some of Cartoon Network’s finest, and to have done so much in her young career. She even made the Forbes’ 30 under 30 in Entertainment list before even creating Steven Universe. Apparently it was for being responsible for “many of the best episodes” of Adventure Time such as “Simon and Marcy” and “It came from the Nightosphere.” You know “The Fry Song?” – that was her!!! But as much as I’d like to talk about my girl-crush on Rebecca Sugar, this article is about her show, not her, so let’s continue on. Rebecca Sugar, adorable badass. Just watch her play that ukelele. She brought you “The Fry Song” with that ukelele! First of all, we have a wonderfully diverse set of female characters. Of the Crystal Gems, there is Garnet, Amethyst, and Pearl who each have a motley array of personality traits, not to mention varying body types, and a very strong presence in the show. Pearl is the neat, organized, perfectionist. Amethyst is fun-loving, rebellious, and a bit brash. Garnet is the stoic and powerful leader of the team. They each have a well developed backstory as well as unique flaws and foibles. Of the non-Gem characters, there is kind and supportive Sadie, who works at the doughnut shop in the town where Steven lives. Despite her nice and somewhat docile demeanor, she is also the only character with no powers to have single-handedly taken down a monster. Then there is Connie, a girl Steven’s age, and Steven’s best friend with whom he can talk to about his worries. Later on, she too, joins in on many of the action scenes. Each of these awesome ladies are people that Steven can seek advice from and be seen as a role-model. This amount of influence and interaction between female characters is exceedingly difficult to find in a lot of media. From left to right: Amethyst, Garnet, Pearl (though you could probably guess based on their color schemes). Another thing that is often difficult to find in any story is an influential mother character. Steven’s mother, Rose Quartz, has an important role in not just Steven’s life, but in the life of all those who met her. Rose is technically never present in the main storyline (aside from flashback episodes) due to having given up her physical form to bring Steven to life. Despite her lack of screen-time, she has a profound effect on the characters. Much of what the Crystal Gems are fighting for come from the inspiration of Rose, and they talk about her often, and usually in a loving and cherished manner. She is somewhat of the role that Steven wants to take on, and the type of person that Steven wants to become. For a mother character to be this much of an influence in her child’s life is actually quite rare in entertainment mediums, especially when a son is involved. We often see the father as the embodiment of what the child should be, or as the parent that drives the character’s goals. It is rare to see a mother in this role, and it is a pleasant change of pace in a series for children. The second main thing that this show does well is to represent, positively, different gender and sexual identities. To begin with, it should be stated that Garnet, Amethyst, and Pearl are not human. They are part of an alien race known as “Gems”, and it has been stated by Rebecca Sugar, that their race is non-binary, or has no separation between sexes. This is getting into headcannon territory, and since this more difficult lexicon isn’t really discussed as clearly within the show, I will do my best to distinguish between what is said by the creators and what is actually stated within the show. Whether Gems are non-binary or not, it is apparent that every Gem character revealed thus far has appeared female, has been referred to by feminine pronouns, and has been voiced by female actors (the obvious exception, of course, is Steven). Some of them even have trouble distinguishing between male and female humans. What I find is interesting here is that it represents a different gender option than what we are used to in a story. The fact that Gems can also transform and change what they look like, furthers this line from adhering to strictly either male or female. Amethyst especially is an interesting case, as she transforms the most, and in one episode even took the form of a male wrestler for a most of the time. I think this is a brilliant way to present the case that gender is more of a spectrum rather than two definitive opposites in a more fun and fantastical way that is easy for children to understand. The last Gem-related ability that I`d like to touch on is “Fusion.” Fusion is when two Gems fuse together to become a more powerful warrior. The resulting Gem gets a new name, new powers, and even a somewhat of a new personality – usually a combination of the two base gems. The point is that the resulting Gem more or less has it’s own identity both separate and a combination of the two that make it up. This furthers what I was saying earlier about the gender and identity spectrum. When Steven ends up finally fusing in one episode, curiously enough with the human character, Connie, the resulting gem is never assigned a gender specific pronoun, and outside of the series the creators even refer to the creation with the genderless pronouns “they” or “them.” “Stevonnie” as they are called, seems to have aspects of both characters and also appears to be attractive to people of both genders (to humans not knowing that they are a fusion). Cartoon Network Studios; Stevonnie, pictured on the right is a Fusion between Steven and his human friend, Connie. Note how both of the people next to them are blushing. In conclusion, Steven Universe does two important things – promotes gender equality and presents different types of gender and sexual identity. It does this most importantly by showing such characters as role-models or people to look up to. When we have females with a strong presence such as this, it helps children in little ways to open their mind to the fact that women can be awesome, too, and have just as much agency as men. The same can be said for characters of different gender identities or sexual orientations. The fact that these aspects are also seen as a non-issue is a breath of fresh air because it normalizes these identity traits, and separates it from the shows or characters where you have the token feminist or the token flamboyantly gay character. This show simply presents them as people with an honest-to-goodness realistic personality. When you create a positive character you are presenting a positive reaction to what that character represents, and this is what makes Steven Universe the most important show for gender equality. *I say “non-heterosexual” here, instead of defining the relationship as homosexual or lesbian, in case you want to be exceedingly technical about a non-human, non-binary couple being in a relationship. But in the end wouldn’t that further my varying gender-identity point anyway? ** I’m not counting Legend of Korra or Adventure Time since the homosexual relationships within those shows were never explicitly confirmed within the series themselves. They were confirmed outside of the series by the creators or cast only.